Posted April 30, 2015 by Tony Jones & filed under Books. 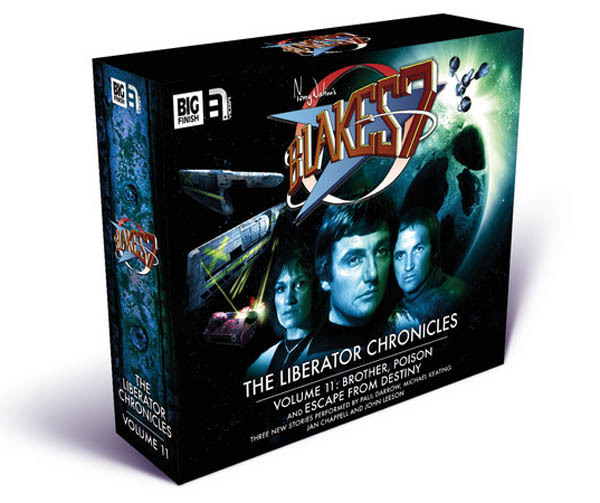 The Liberator Chronicles from Big Finish are a regular set of boxsets, each of three CD releases telling new stories for the Liberator crew. Unlike the full-cast series, these stories each have two main narrative voices though in recent releases these are often supplemented with additional, minor characters. They have always been interesting, entertaining and sometimes brilliant; with this release the stories manage to strike all three notes. First is the Nigel Fairs story, Brother. This is the story of Avon (Paul Darrow) and his kidnapping of Gustav Nyrron (Anthony Howell). On a devastated world, two men explore dark corners of their pasts and make choices about their futures. We learn a lot about how each man became who they are, and the contrast between Avon and Nyron (both actors are excellent) fleshes out a story that explores prejudice, religion, intolerance, disease and much else. Lighter, though no less serious, is Poison, a story by Ian McLaughlin. This gives us the story of Vila (Michael Keating) working undercover on a Federation freighter as he infiltrates the crew and explores the mystery of the ship’s hold. His time is also spent flirting with Jance (Samantha Béart) and although this is on some levels a less substantial piece, as we explore Jance’s backstory and learn the dark secrets of the reasons behind the Federation’s regular runs to an apparently unremarkable frontier world. Finally, Andrew Smith keeps up the quality with Escape from Destiny. This is notable on many levels – not least for not only having Louise Jameson playing a character but also her taking the reigns as director. This means we have both Louise and Lisa Bowerman directing on this set and both get the absolute maximum from their casts. This story is a Vila / Cally (Jan Chappell) tale of a world suffering from famine, imminent Federation invasion as well as political intrigue. It is all spelled out through interaction with a scientist and his family but what seems a familiar set of pieces is deftly manoeuvred by Andrew to keep us in suspense and give us a few surprises while explain how quickly society can move to disorder and the lengths the Federation can go to achieve their aims. There is a theme of family running through all three stories, not that they are similar apart from the sheer quality of their production. This is amongst the very best of these boxset releases and proof positive, were it needed, that the Blake’s 7 stories are now every bit as essential as any other series from Big Finish. If you’ve ever been tempted to try, now is the time. Released on 10 March 2015 by Big Finish Productions Ltd.